IAN Baird felt Saturday's 4-3 defeat at Maidenhead encapsulated Eastleigh's hit-and-miss season in 90 rollercoaster minutes. Having fallen 2-0 down, the injury-riddle Spitfires hit back to lead 3-2 only for the relegation-battling Magpies to equalise and then score what they believed to be a Blue Square Bet South life-saver with 92 minutes on the clock. But there was to be a painful sting in the tail for the Berkshire club when news filtered through that Havant & Waterlooville had also scored a dramatic stoppage-time winner against Staines and it would be the Hawks staying up at the Magpies' expense. "Maidenhead celebrated like they had won the Champions League but then, unfortunately for them, they got the news that Havant had scored," said Baird. 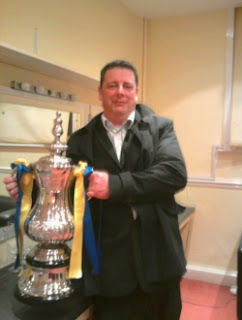 Despite the ill-feeling that followed Baird's shock decision to quit Havant and join Eastleigh in 2007, the ex-Saint insists he had no feelings either way on the relegation issue. EASTLEIGH boss Ian Baird doesn't mind admitting he will be glad to see the back of the 2011/12 season. In all his time as a manager he has never experienced a rollercoaster ride quite like it. When the season kicked off in August, the Stoneham Lane club had taken a cost-cutting change of direction, parting company with several core senior players and opting to run with a mix of youth and experience as part of a player development scheme. Baird's brief then was to ensure Blue Square Bet survival - and anything more would have been a bonus. But the picture changed dramatically just priot to Christmas when Bridle Insurance burst onto the scene with ambitious plans to turn Eastleigh into a Football League club. Baird was furnished with funds to significantly strengthen the playing personnel and start building a squad capable of challenging for promotion to the Conference National - if not this season, then next. The most exclusive event in the club’s calendar, our annual End of Season Dinner and Awards Evening will take place in the Clubhouse, here at the Silverlake Stadium on Saturday 12th May starting from 7pm. It promises to be a memorable occasion as players, Directors, staff and supporters come together to celebrate all that is good about the Spitfires. Among the numerous awards to be handed out on the night will be, Player of the Year and Player's Player of the Year for the 1st Team, Suburban and Wyvern squads. After you have enjoyed our Hot Buffet there will be the presentation of those all-important awards followed by a comedian. The evening will end with a disco, all of which should make this a memorable night for everyone. To book your place please call Shauna on 02380 613361. Tickets are £17.50 each, making a table of 10 just £175.00. An afternoon that was full of emotion for an Eastleigh side that on the league front were just playing for pride, though their hosts were heavily embroiled in a Blue Square Bet South encounter with Eastleigh’s Hampshire neighbours Havant & Waterlooville. Before the game kicked off Maidenhead United were favourites to lose their Blue Square Bet place after a five season run in the Division. The mathematics of the afternoon for Maidenhead was easy, a must win and then keep an eye on the Havant & Waterlooville result as a Havant victory against their afternoon opponents Staines Town would condemn Maidenhead to the drop anyway. Ray Murphy owed a great debt to his mate and physio David Penny for managing to complete the 2012 Virgin London Marathon. Having been satisfied with his training over the past twelve months to be prepared for his second ever Marathon attempt, Murphy was in despair when seventy two hours prior to Marathon day Murphy rolled out of his bed at 4.45am to make his trip to work to find himself in agony and hardly able to move owing to pains shooting from his right leg. Having registered in at the Marathon the previous day Murphy spent the evening with his sister June in Upminster and stayed over with her family for the evening and a sleepless night had been taken with the pain seemingly arising from nowhere. Knowing that he had to drive to Chichester for work and that his mate Penny was due to go to Ilfracombe that day Murphy in hope dropped a text to his physio at 5am. Ian Baird’s Spitfires were harshly denied all three points last Saturday at the Silverlake Stadium at home to Chelmsford City. Eastleigh enjoyed much of the possession and it paid off with just seven minutes of the game remaining. Daryl McMahon sent a pinpoint cross into the box for the oncoming Andy Forbes to head the Spitfires into a 1-0 lead. With time on the clock running out, Michael Green who had an otherwise impressive game, tripped Ricky Modeste in the penalty box and referee Neil Hair awarded a penalty. Captain David Rainford, back from suspension, stepped up sending Jack Dovey the wrong way to earn The Clarets a share of the points. Eastleigh now play relegation threatened Maidenhead United away at York Road (3pm kick off) where the FA have acknowledged that it is the oldest continuously used senior football ground in the world by the same club. IAN Baird says people are way off beam if they think Eastleigh will try and get their arch-rivals Havant & Waterlooville relegated tomorrow. With the Spitfires due to complete their Blue Square Bet South campaign at third-to-bottom Maidenhead United, cynics have been chewing over the notion that they might deliberately lose in the hope of sending Havant down. The Westleigh Park club are just one point above the drop zone and could be heading back to the Southern League if they slip up at home to Staines Town and Maidenhead and/or Hampton & Richmond Borough win. But even if Baird did wish relegation on the clubhe used to manage - which he doesn't - he knows it's in his and Eastleigh's best interests to end the season on a high. "People have been saying that maybe we'll lie down tomorrow, try and help Maidenhead and finish off Havant - but that won't happen," he insisted. Hampshire FA is delighted to advise that Hawk-Eye, one of the two IFAB (International FA Board) approved companies along with GoalRef, will commence testing at the Hampshire FA Senior Cup Final sponsored by BSA Regal Group between Eastleigh FC and AFC Totton on 16 May 2012 at Southampton FC which will be the first ever ‘live’ match with these conditions. EMPA (Swiss Federal Laboratories for Materials and Science) will be testing both systems between 10 May 2012 and the beginning of June. It is important to stipulate that only the EMPA observer in the stadium at the final will have access to the goal line technology system readings and will not be utilised by the match officials. Eastleigh's final home game of the season saw the points shared in a 1-1 draw with Chelmsford. Both goals were scored late in the game as David Rainford converted a penalty in the 88th minute to cancel out Andy Forbes' header seven minutes from time. Three changes were made to the starting eleven from the side that defeated Welling United 1-0 last weekend. Gary Elphick, Lee Peacock and Bradley Bubb replaced Will Aimson, Jamie Brown, and Sam Wilson as the Spitfires sought to go a third game unbeaten. The best of the first half action saw a strong turn and run from Bradley Bubb in the 5th minute force an early save out of the visiting goalkeeper Stuart Searle. The on-loan striker's effort was struck well and had to be turned away for a corner. Ian Baird’s Spitfires sent out a youthful side away to third-placed Welling United last Saturday, a team that hasn’t lost at home all season before the match. Today's opponents fifth-placed Chelmsford City, need a win in the Blue Square Bet South at The Silverlake Stadium. If Chelmsford are to win and Dover and Basingstoke lose, The Clarets would secure a play-off place. Chelmsford’s opponents last Saturday were Salisbury City. The Clarets took a comfortable lead after only six minutes with former Spitfire Jamie Slabber netted for the home side, just as he did 36 times for The Spitfires. EASTLEIGH have underscored their commitment to youth by offering contracts to four more up-and-coming young guns. Seventeen-year-old striker Sam Wilson is already under contract for 2012/13 and now Ben Wilson, Will Aimson, Matt Gray and Callum Casson have the chance to join him. Director Neil Fox and manager Ian Baird met the quartet on Wednesday and gave them until today to decide if they want to be part of the club's exciting future mapped out by Fox and fellow majority shareholder Stewart Donald. Although Baird believes he will need a street-wise squad to achieve Bridle's goal of promotion to the Blue Square Bet Premier, the club will not close the door on youth. DANNY Smith’s 39th-minute winner at Welling United on Saturday is a contender for Eastleigh’s goal-of-the-season. Statistically it had much to recommend it, completing a notable season’s double for the Spitfires against a Wings side already assured of a place in the Blue Square Bet South play-offs. It was the first goal Welling had conceded in over five games and 535 minutes and ruined the league’s last remaining unbeaten home record. But what really delighted Eastleigh boss Ian Baird was that victory was achieved with three teenagers in the starting line-up and that Smith’s winner rounded off a sweet 16-pass move. “We scored a very good goal considering we don’t play any football!” said Baird, tongue firmly in cheek. “Danny’s arrived late in the box to meet Mitchell Nelson’s cross and tucked it into the middle. “We had a young side out, including Will Aimson and Sam Wilson, both 17, and we beat a Welling side who had come off the back of five clean sheets. Ian Baird’s Spitfires will look to claim only their second win in their last nine league games as they play third place Welling United away at Park View Road (3pm Kick Off). Eastleigh did however manage to pick up a point away to Weston-Super-Mare on Easter Monday away at The Woodspring Stadium. The game ended as a 0-0 stalemate, which extends The Spitfires drought of no goals in their last two games. Welling United however are enjoying life in the Blue quare Bet South sitting nicely in third place - their last game was at home to already relegated Thurrock at Park View Road. Midfielder Harry Baker scored the only goal of the game in a 1-0 victory for The Wings which moved them one step closer to secure a third place spot. The last time these two teams played was earlier in the season and it saw somewhat of an upset as Eastleigh ran out comfortable winners that day. 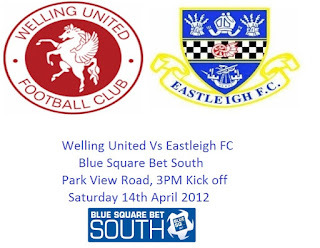 THE average age of Eastleigh's squad will be lowered at third-placed Welling United tomorrow. Manager Ian Baird had pledged to give some promising young guns an end-of-season run-out if the Spitfires amassed a healthy points haul over Easter. In the event they gathered just one out of six in the Blue Square Bet South, following a 1-0 home defeat by Dorchester with a 0-0 stalemate at Weston-super-Mare. But, with senior trio Damian Scannell, Chris Flood and Jamie Brown all injured, Baird has opted to give youth a chance against a Welling side already guaranteed a play-off berth. The manager confirmed on Monday that Scannell would not play again this season due to an ankle injury and the same now goes for Flood who needs complete rest after playing with a hip/groin problem. Brown is also sidelined after hurtling into a pitch-side hoarding at Weston and banging his knee. EASTLEIGH will almost certainly be without injured flair player Damian Scannell for what is left of the Blue Square Bet South season. Scannell did not feature in yesterday's 0-0 stalemate at Weston-super-Mare having bowed out at half-time during Good Friday's home defeat by Dorchester. "I don't think he'll play again this season," admitted manager Ian Baird. "He picked up an ankle problem at Bromley four or five weeks ago and he's been playing with the injury. "Damian wants to play, but he's not doing himself any favours. That's why we took him off on Friday." Without Scannell, the Spitfires produced a solid if unspectacular performance against a Weston side who had won just one of their previous 13 league games. The visitors' best chance came in the opening five minutes but on-loan Aldershot Town striker Bradley Bubb came off second best in a one-on-one with the keeper. Yesterday (Sunday) Eastleigh FC under 18's beat Christchurch under 18's in the league cup final. The final score was 4-2 with Liam Seager opening the scoring to give Eastleigh the lead only to be pegged back to 1-1. Christchurch then had a player sent off for two bookable offenses. The young Spitfires then took the lead before half time when Joe Chamberline hit a 25-yard shot that squeezed its way through the keeper's legs into the back the net. The Spitfires were defeated by a stoppage time own goal from centre back Gary Elphick on this Bank Holiday Good Friday fixture against Dorchester Town. Ian Baird named an unchanged starting eleven from the side that beat Eastbourne Borough 2-1 last Saturday. The first chance of the game fell Eastleigh's way as Bradley Bubb broke down the left and cut the ball back for Chris Flood, whose effort from six-yards was cleared off the line by Jake Smeeton. In the 22nd minute a set piece from the visitors saw Neil Martin play a short pass for Kyle Critchell to shoot. The former Southampton youngster's shot was deflected for a corner. Neither side were able to conjure any clear cut chances in a poor first half with Dorchester perhaps looking the more threatening side with Martin and Nick Crittenden providing width and deliveries from the flanks. We should shout about ourselves more! MANAGER Ian Baird believes Eastleigh should be making more of their youth development programme. Having helped the likes of Aaron Martin and Brett Williams into the Football League, the Spitfires are celebrating another significant success story. Seventeen-year-old defender Will Aimson is joining Championship club Hull City on a one-year scholarship following trials on Humberside. Like Saints star Martin, the Spitfires' reserve team skipper is a commanding centre-back. He will join Hull as a third-year scholar after completing his second year at Brockenhurst College. Baird said: "It's another milestone for Eastleigh. But I don't think the club have made enough of the players we've had here, like Aaron, Brett, Mark Marshall and Damian Scannell, who have made it to the Footbal League. "Other clubs shout it from the rooftops and Eastleigh should do more to show what young players can achieve if they come here." Ian Baird’s Spitfires will be in search of back to back wins on this Bank Holiday Good Friday fixture as they entertain Dorchester Town in the Blue Square Bet South at the Silverlake Stadium (3pm kick off). After going five leagues games without a win, Eastleigh bounced back with a win at home to Eastbourne Borough last Saturday, where it took just three minutes for the Spitfires to take the lead. Gary Elphick, who captained Eastbourne earlier in the season against Eastleigh, got on the end of a Daryl McMahon cross much to the delight of the whole team who ran to the dugout to celebrate with manager Ian Baird. Just five minutes after the break captain Tom Jordan sent a powerful header into the back of the net after another Daryl McMahon cross to double Eastleigh’s lead.